» Creating new animations (TRAMS) for Oni. Re: Creating new animations (TRAMS) for Oni. EdT I'm trying to give the typhoon a new super punch by modifying Striker's\TCTF SWAT super punch .. the plan is to add some of the Elite's super punch to it too . so is that normal and expected ? or is there something wrong going on ? also if I want to mix this move with the elite's super :S how do i do that ? mix two moves ? also do u have a very basic tutorial on the expressions ? is a key different from a frame :$ ? and how do u remove a key ? if i wanted to remove the key or frame 14 where the body was tilted .. do i select the region between 13-14 and delete ? or cut ? or should I move the other frames over it ... whatever I try seems to mess up the other frames too ... and how do I make the animation shorter it has 40 frames I deleted from 28 upward but when it plays it still goes to 40 but with no animation change. P.S : now I have much more appreciation to the moves u made ! Samer: Obviously, you didn't read my tutorial Just teasing, maybe my tutorial was not as clear as I thought. 3) If you get odd rotations where a body part is rotating in the wrong direction, select the part, go to the popup menu under the timeline called "Animation" select the option "Make Rotation Keys Continuous"
So at frame 14 you're getting the odd rotations. It seems that the pelvis and right and left thighs are the ones that get those odd rotations. Sometimes, you have to keep applying that option to the body part as you are editing. If you look next to the timeline in the box it says 40, you will change it to 27 or whatever it should be. A frame is a point in time, so with animations for Oni, there will be 60 frames for 1 second of action. A key is where a part's parameter is set: location, rotation and probably size. So if you want the pelvis to be at a specific location, you will select it then press the key icon to key it. That's what's cool about 3D animation, you key certain parts then XSI will make the transition between the keyed frames. So normally you will call a frame that has a key a keyframe. One way to remove a key, is to select the body part with a key, notice that the key icon is red, click on the key icon, it turns green and the red mark is removed from the timeline. The second way is using the DopeSheet, select the key to be deleted and click on the X icon. Mixing 2 moves, unfortunately, I have not figured how to do that in XSI. But a workaround is to extract the 2 moves as XML, then combine them together. You will add the 2nd animation's Heights, Velocities, Rotations (You will have to add the data to each Bone), Positions to the first one. You can ignore the other stuff, these items will give the animation data for XSI. Don't worry you will soon learn quickly. Its an idea for a new punch_heavy move. Now I can edit the animation in XSI. Don't know how well it will work, but I thought I'd give it a try. btw the fury's running punch is really interesting for a super, is it easier to make a series of the same move ? example 3 of the fury's running punch combined in one move ? will the difference in heights of the fury and striker be an issue in the game, will motoko's feat sink ? or since u copied the data for each bone and not the other heights section it won't ? or is the heights data rewritten when u export the move ? or am I talking nonsense ? Samer: Not sure what I'll do with this, it was more of a test of combining a number of TRAMs into one. It is easy to copy the running punch, by first selecting all the body parts, then in the DopeSheet, copy the frames of the move, then paste the frames. You will have to have some form of transition between the moves. Regarding the Striker's height data, I used a spreadsheet to lower the heights to fit Motoko and then put that data into the XML file before converting. If I used the Striker's height data, then Motoko would have been floating above the ground. I had to copy and paste 19 bones 3 times to make the XML data, so it took a few minutes. If we want to modify the height position of pelvis and the velocity of the body correctly to make a smooth animation, it is also necessary to do it in XML. For example (er..) I used to want to make Barabus' earthquake jump higher, so at the frame which he jumps to the highest place, I increased the height from 19.56 to 25.13. I did the same to the frames before that one and decreased the height of the frames after steadily. But after that, his jump looked weird. As Gumby said, the orbit of the jump should be parabolic so I tried to find the proper quadratic function of the height. Ha, the jump looks good now. I also want to make elite's super punch a bit more efficient, by making his body move on a round in front of him and return to the initial position. I may need to find the proper sine function of the back/front and left/right velocity, I don't know. I don't know where I can get the software to make animation so I'm just still modding it in XML. If I could get it I would definitely learn about it for some fun in my spare time, as I think modding animation is my most favorite hobby about Oni. Of course, it is better than doing nothing. Thanks. I didn't know that software before. It seems big (440 MB) for me. I've asked my brother to download it so I think I'll get it later. I have a major problem. if i want to re-modify some simple detail in the move, a hit impact or hit points for example. I convert the oni back to xml : in the xml i get Qkeys instead of Ekeys, then i do the modifications say change the hit impact, or effect, save the xml and try to convert the xml back to oni : Onisplit doesn't convert it. something about can't read Qkeys. is there any way to work around this ? thx EdT it worked I hope there won't be any cons later though. so far .. I've managed o make new moves by merging and modifying existing ones. I still don't know hot to make completely original moves like EdT. paradox and Mukade did. the part i'm stuck at is ... how do u position the body parts :\ ?? say u want to do a kick starting from the idle pose animation. would u rotate or translate the body parts ? and would u translate each part individually ? the thigh the calf and the foot each at a time ? they look weird when i do that ...and would u do that for each frame D: ? to make the leg raise for example in each frame it will raise a little bit more. or do u make like few major frames and let xsi make them continuous on its own ? also what are some tips for making throws. i want to make a custom throw for hayate. Usually, I start with the idle TRAM, keep the first frame and delete the rest. Then I would focus on the pelvis' position and rotation and make keyframes of the pelvis every ten to 20 frames depending on the move. Remember that 60 frames equals 1 second of animation. XSI will make the in-between frames. 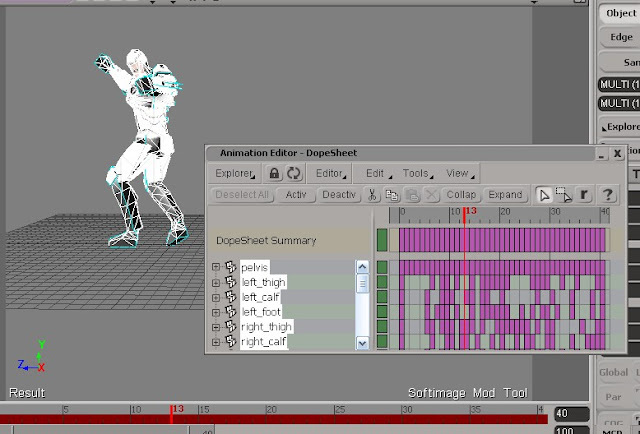 Next is to position the major parts of the body at the keyframes. Thighs will affect the calf and feet. Chest will affect the upper body, biceps affect the wrist and hands. So you start with a very rough animation, then start adding details. Loser suggested keyframing all the parts to make the animation look better. For example I have an animation that is 60 frames, I would set a keyframe at 0, 15, 30, 45 and 60. At each of these frames I would position all the body parts to the proper position and rotation. Then keyframe each of the body parts at that frame. Sometimes, XSI will have the part move in the wrong direction, so you may have to create another keyframe to get the body part moving correctly. I have never made a throw, but you will need to make 2 animations for the character and the target. You would create both animations in a single scene, so its easy to visualize. However, the target animation has to be rotated 180 degrees. Paradox has experience with this aspect. EdT told you pretty much all everything. IMO, the step between changing animation and making 'completely' new ones is only a psychological step. About throws: I didn't made many of them, probably three and I kept the files only of one. So my experience is acually little here. Besides the pelvis rotation you also need to change its movement direction. Example: not import-ready and import-ready. EdT following ur tutorial ... i came to this step, putting the dae file name in the xml and converting to oni. so i put in the end field 180 .. it does convert but oni split says : Warning the specified animation end frame is beyond the last key frame, using the last frame instead. i couldn't get above 100 in the end or the game doesn't start ... is 100 the limit ?? or am i do doing something wrong ? so 0.95 doesn't convert more than 107 and 0.941 doesn't convert at all when i add the dae import flag. also 0.95 has another bug : once a move is done and it's in oni .. convert it back to xml edit something and try to convert back to oni, it can't convert it something about can't read Qkeys. I'm starting to look around XSI and when I try to import... erm... ONCCmuro_generic.oni, exported as .dae (this is the problem? According to the picture, eez not) using crosswalk (File/Crosswalk/Import) and I get an error called Unspecified Failure. Erm... Can't find anything there. paradox - EdT - mukade have u successfully made an animation more than 107 frames before ? if so what onisplit did u use ... i'm really stuck i need to make jester that final animation before i release him and start on the hammer. anyway if someone's feeling up to it i started the move by combining 2 elite heavy kicks in xml the imported to xsi (cannon balls) and deleted the frames to make it 1 continuous roll .. the idea is to raise the pelvis at some frames to make a bouncing ball move. "and 0.941 doesn't convert at all when i add the dae import flag"
The dae flag is a newer feature. 0.941 doesn't know that flag so it can't handle it. For long animations use 0.941 and following command. Then edit the xml file. Types, variant, attack, part., etc have to be added.